« Forever Fangirl: Archie Meets Kiss… Yes, You Heard That Right! So, I knew very little about Dylan Dog when I went and saw the movie, Dylan Dog: Dead of Nightwith my brother. I had already ordered my copy of the book a month or so before, based on the Previews description that I’d seen. But other than that, I was open for a new horror film. It was OK – I didn’t hate it. So, when I got my copy of The Dylan Dog Case Files a few weeks later, I wasn’t absolutely driven to dive into the pages and pages of reading – it’s a big book. But eventually, I gave it a chance and wow – I was amazed by how good it was. The art is simple, black and white, elegant storytelling. The writing is nice and smooth, allegorical and not at all about concrete reality. It is has a strong use of existing horror icons/monsters but in new ways. Several of the stories have a kind of Hunter S. Thompson quality because they exist in a trippie, dreamy world of zombies and other monsters that may actually just be the imagination of the main character, Dylan Dog. Do I have one complaint? Sure. The book is VERY masculine and the female characters at times come off as stereotypical and flat because of their strange obsession with Dylan Dog. But this can, to some degree be written off as part of the character, part of the story. What does all of this lead me to? 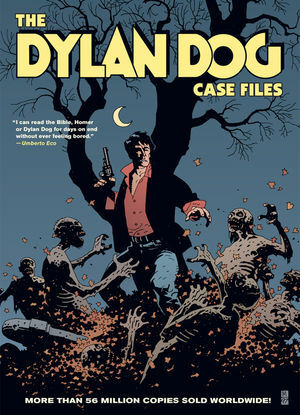 Even if you’ve seen Dylan Dog: Dead of Night and hated it, if you like smart, twisted, well-written horror, go to your local comic book store and pick up The Dylan Dog Case Files by Tizlano Sclavi, Mike Mignola, Angelo Stano and Andrea Venturi. This entry was posted in Columns and tagged Andrea Venturi, Angelo Stano, Dylan Dog, Dylan Dog: Dead of Night, Mike Mignola, The Dylan Dog Case Files, Tizlano Sclavi. Bookmark the permalink. Follow any comments here with the RSS feed for this post. Post a comment or leave a trackback: Trackback URL.